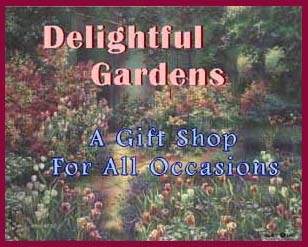 NetControl.net Archive of ::Delightful Gardens Gifts: Gift Baskets for Gardeners, Wind Chimes, Fine Garden Art Prints, Children's Gardening Tools and T-shirts, Bird Baths, Sundials & Fountains, Applique Flags and Simply Unique is a must see category! Give a gift of laughter - Select a Yardbird or a "Compost Happens" T-Shirt! If it is tranquility and beauty that you seek then select from garden scenes of Fine Art. Embellish a garden with lovely sounds of a Windchime or a Water Fountain. Add detail and craftsmanship to a garden with a Sundial or Bird Bath.